Lately I have been concerned about what is in bath products, which is why having so many body- and environment-friendly companies involved in April Showers is so exciting for me. The chemicals on the back of bottles whose names I cannot even pronounce, let alone figure out what they are supposed to do for me, are creepy. Episencial takes all of that wondering out of the equation when it comes to personal care products. Their company it the epitome of “green!” They are baby-safe, chemical-free, all-natural (no artificial anything! ), and made from sustainable and recyclable aterials under solar power. I know a lot of products that say they are all-natural still have what seems like mystery ingredients, but this is not the case for Episencial. Each of there ingredients on the package comes with an explanation as to where it came form and what it does. 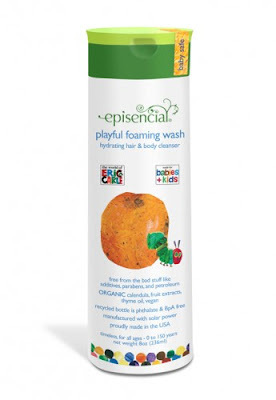 For example, the Playful Foaming Wash I got to try is fragranced with Citrus Nobilis, which is Mandarin Orange, essential oil. Episencial sent me the Playful Foaming Wash and the Sweet Dreams Bubble Bath. What stuck me first was the packaging, which is illustrated by Eric Carle, of Very Hungry Caterpillar fame. This got an audible, “awwww,” from me. After admiring the cuteness, I flipped the bottles over to read the ingredients, which I write about above. Using the products was equally pleasant. The concentrated formulas (which I imagine leaves consumers wasting less product) are both extra bubbly, which was fun, and left my skin feeling clean but neither dry nor greasy. The gentle formula did not irritate my sensitive face. The fragrances are light and very natural-smelling, and left my skin with the slightest citrusy scent. Epiencials’ skin care line includes bath and body products as well as chemical-free sunscreen, all recommended for ages 0-150 years, so they are safe for everyone in the family. They also have a special baby skin care line with baby wash and special diaper spray for extra-sensitive bottoms, among other products. Everything is paraben- and petroleum-free, so these are products I would not only use for myself, but for my very special, brand-new god-daughter. Episencial products are also very affordable! The Sunny Sunscreen would be great for my daughter! I love the Eric Carle designs on everything. . . I would love to try the Nurturing Balm. I'm part of the Simply Stacie Blog Frog Community.